You need to put a little more thought into this project -- more than the bouncing ball or floating balloon or bubble. With your best thumbnail drawings by your side and bunch of blank animation bond on the other, its time to start figuring out how to layout your animation. This entire scene should be done in one shot, so we can concentrate on the action of the sack falling and hitting the ground. You can also add another obstacle below, so the sack hits it first and then flops onto the floor and comes to a stop. Begin with your field guide to determine your camera view. Design a simple background of the location and figure out where the sack positions are going to be. Instead of a simple flat drawing like this.. Create a background using perspective and dimension. 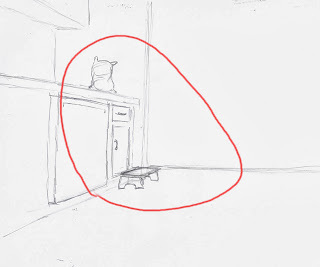 Below is a rough drawing where the sack is sitting on the counter and on the floor below is a small stepstool. I want the sack to hit the stool before hitting the floor. 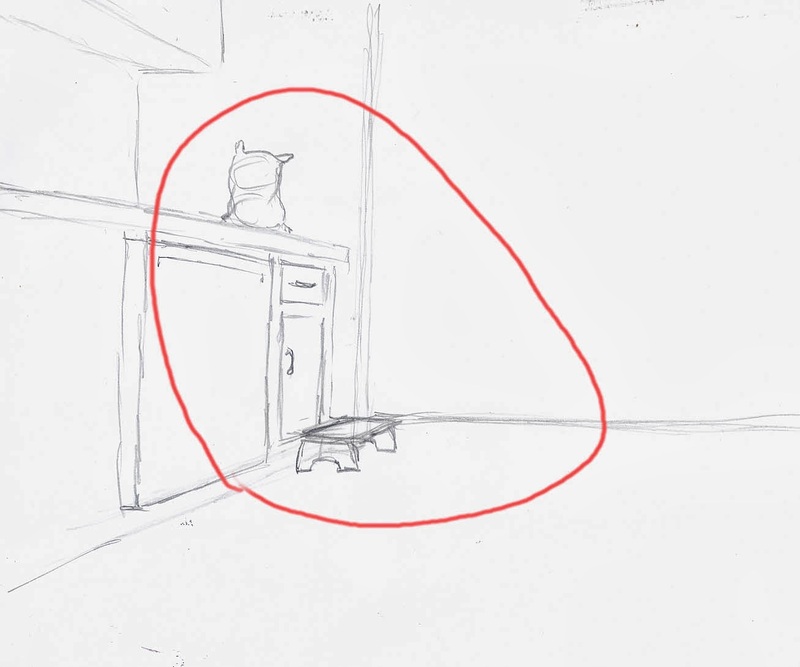 The red line represents where the main action will be, so you will want your background details to be minimal and not interfere with the animation drawings. Using the background image above as an example, you will want to make a layout drawing of only the main positions of the sack. To keep it simple, let's ignore the stepstool for a moment. 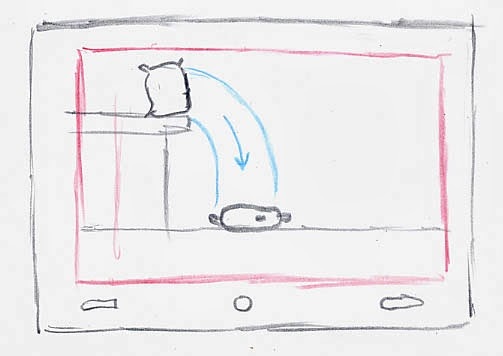 Position 1 would be the sack sitting on the counter, Position 2 would be the beginning of the fall, Position 3 would be the sack's first contact with the floor and Position 4 would be the final end pose of the bag. Those would be your initial key layout drawings. Now its all about timing out how many frames each action should take to do in seconds. The best way of timing out anything is to take a sto watch and act out the action in seconds. You will be able to figure out any staging problems that might occur and you will be getting the scene in your head as well. Do this a few times to get an average and then you can convert the seconds into frames. Remember, it depends at what frame rate your camera is shooting at. The standard would be 24fps (frames per second), but sometimes it could be 30fps or some other frame rate. For this example, let's use 24fps and begin with the sack sitting on the table. I always tell my students to delay the beginning of the scene by holding on the background for at least 16 frames. This short amount of time gives your audience mental preparation to watch something animated. If you just start the action right away, your audience might not see the beginning of your animation and would be trying to figure out what they were watching. Beginning with the sack sitting on the counter, you need enough time to show where we are and what's in the scene. Staging is very important here -- you don't want your audience to question what they are watching. So it's OK to hold on this still image for 3 or 4 seconds, or maybe longer. Convert your timing into frames. Let's say the establishing shot is 4 seconds. 24fps x 4 = 96 frames. Put that down on your exposure sheet (Fr 1 to 96) and remember this is only one drawing held for 96 frames. Next; the sack sits and slowly tilts forward, speeding up to begin the fall. 3 seconds converted to frames: 24fps x 3 = 72 frames and 96 + 72 = 168 frames in screen time. But since we are shooting on 2s, we have to draw only about 37 drawings. 1 drawing for 96 frames and the tilting forward into the fall equaling 36 drawings. When the sack falls, it can fall straight down or flip over during the fall. You may want to find a similar object to study how it falls and hits the ground or another object. You can even shoot it on your phone to see how long the process takes. Shooting reference footage is a great way to study how things move and apply it to your animation. If you have the technology, use it. Here's my reference footage of the sack falling in different ways. This sack contains sand which is heavier than flour or rice. When pushing it over, the contents inside begin moving. The bottom is still as the contents shift their weight forward causing the top of the sack to slump forward at the beginning of the fall. When the sack falls and hit the ground, it doesn't suddenly freeze to a stop. If we could watch the video at a slower speed, you would see the main weight of the sack hitting and the rest of the sack slightly delayed in coming to a stop. This would cause a slight movement to the sack after it landed on the ground. This type of movement in animation is called Recoil and occurs as an after-effect of an abrupt stop, the lighter parts of the sack go past final pose and the then settle back to stop. If you can watch a video frame by frame, you will see a lot of changes like this which you can't see in real time. Now a sack of flour can sit on a counter for days if not decades without being disturbed, so you should figure out a simple way to motivate the sack into its fall. I animated a bowling ball rolling in, which pushes the sack to the edge of the counter to start its fall. For added pleasure, I kept the bowling ball moving very slowly forward until it too falls off the counter and hits the sack on the floor. Here's the rough animation of my project so far. SackDrop01 from Toondini on Vimeo. I 'm still thinking about how the bowling ball would react when hitting the sack on the floor. Would it bounce off since a sack of flour is pretty hard? If it bounces, where does it go? Does it bounce and roll off the sack, continuing off screen? Animators ponder thoughts like these all the time. Even at 3:00 in the morning we are working on them, thinking about how to solve a problem. We want our animation to make sense to our audience while its entertaining or educating them. Sometimes you have to test out things in the real world when animating realistic objects. I had thought that the bowling ball would hit the sack and bounce or roll off in some kind of way. To test my theory, I dropped a real bowling ball onto the sack at different heights and discovered the sack absorbed the impact of the ball like a pillow, causing the ball to stay in one place. Here's a link to an in depth explanation about timing. Next up: Animating the Sack Drop.